Background: Pleural effusion is very common in congestive heart failure, and should resolve with treatment of congestive heart failure, including diuretic. However, refractory, recurrent, massive, or significant pleural effusions contributing to symptoms in the patients with congestive heart failure warrant treatment by pleural drainage. We sought to discover the clinic-pathologic characteristic of such pleural effusion in our congestive heart failure patients. Materials and Methods: Retrospective analysis of medical records of congestive heart failure patients admitted for inpatient treatment between January 2007 and June 2011. Results: Out of the 342 patients that presented with congestive heart failure during the study period, ten (2.9%) patients had significant pleural effusions in 12 pleural spaces that contributed to symptoms and refused to resolve on treatment of the congestive heart failure including diuretic. Male:Female was 1.2:1, modal age range 40-50 years, 50% in the left, 30% in the right, and 20% bilateral. The estimate of the pleural effusion was <1000 ml->2000 ml with 90% being transudate and 10% exudates. One patient had associated pericardial effusion. Upon drainage, 70% of the patients improved immediately. Conclusion: We recommend drainage of refractory, recurrent, massive, significant pleural effusion in congestive heart failure contributing to symptoms and responding to diuretic therapy. Pleural effusions, the result of the accumulation of fluid in the pleural space, are a common medical problem. They can be caused by several mechanisms including increased permeability of the pleural membrane, decreased negative intrapleural pressure, decreased oncotic pressure, obstructed lymphatic flow, and increased pulmonary capillary pressure or increased hydrostatic pressure. Pleural effusions are classified into exudative and transudative using the Light's criteria. A transudative pleural effusion occurs when the balance of hydrostatic forces influencing the formation and absorption of pleural fluid is altered to favor pleural fluid accumulation, and is the type usually encountered in patients with heart failure including left ventricular failure and congestive heart failure. , Heart failure is reckoned as a very common cause of pleural effusion in all parts of the world, and also discovered to be the commonest cause of pleural effusion in some parts of the world. ,,,, The pleural effusion in heart failure is usually small, bilateral, and spontaneously resolves with the treatment of the heart failure. Rarely does pleural effusion associated with heart failure requires drainage. ,, Our experience shows the occurrence of symptomatic pleural effusion in our heart failure patients which would not resolve spontaneously with heart failure management, therefore, requiring drainage. This study therefore aims to elucidate the clinico-pathologic characteristics of pleural effusion in cardiac failure patients requiring closed tube thoracostomy drainage (CTTD). The following signs of pleural effusion were evaluated on each patient's postero-anterior (PA) and lateral chest radiograph obtained at the time of presentation: Blunting of the posterior and lateral costophrenic angles; the meniscus sign; manifestations of subpulmonic collection of pleural effusion including increased separation of aerated right lung and subdiaphragmatic fat on the right compared with prior chest radiographs, increased separation of aerated left lung and the gastric air bubble on the left compared with prior chest radiographs, and flattening or lateral shift of the "apparent" apex of the right or left hemidiaphragm (pseudodiaphragm) compared with prior chest radiographs; and obscuration of pulmonary vessels below the level of the upper margin of the pleural effusion or right or left pseudodiaphragm. The presence or absence of pleural effusion in the right and left hemithorax was recorded for each case. The size of pleural effusion was roughly quantified as follows. If minimal detectable blunting of the posterior and/or lateral costophrenic angle was evident on the PA and lateral chest radiograph, the quantity of pleural effusion was classified as small. This is reported to correlate with pleural effusions in the range of 25 to 525 mL. Effusions were classified as moderate in size if the effusion occupied the lower part of the hemithorax but did not extend above the fourth rib anteriorly on the PA view. This correlates with pleural effusions larger than 525 mL. 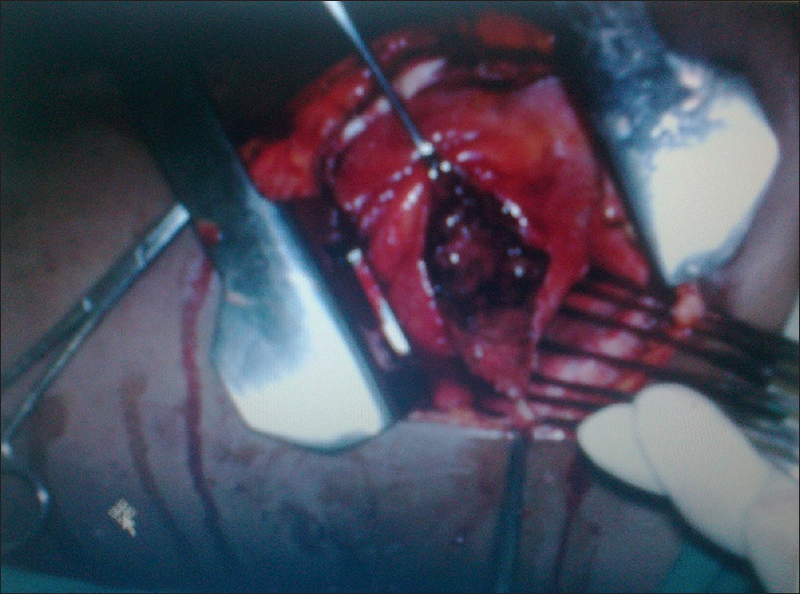 ,, Large effusions extended above the level of the fourth anterior rib on the PA view. ,, The distribution of pleural effusion was recorded in each case as falling into one of the following five categories: Right-sided only; bilateral but larger on the right side than the left; bilateral and of roughly equal size on each side; bilateral but larger on the left side than the right; and left-sided only. When there were bilateral pleural effusions, the following criteria were used to determine whether or not the effusions were of the same size. Since the posterior costophrenic angle is lower in position in the hemithorax than the lateral costophrenic angle, small pleural effusions typically cause blunting of the posterior costophrenic angle on the lateral chest radiograph before they cause blunting of the lateral costophrenic angle on the PA chest radiograph. Small bilateral pleural effusions were classified as being of the same size if there was either minimal blunting of both the right and left posterior costophrenic angles, or if there was minimal blunting of both the right and left posterior and lateral costophrenic angles. Small pleural effusions resulting in blunting of both the posterior and lateral costophrenic angles on one side were said to be larger than small pleural effusions that caused blunting of the posterior costophrenic angle only on the other side. Moderate and large bilateral pleural effusions were said to be of the same size if the position of the highest point of the meniscus of fluid along the right lateral chest wall was at the same level as the highest point of the meniscus of fluid along the left lateral chest wall, or if the two were separated by a centimeter or less. Moderate or large pleural effusions on one side were said to be larger than moderate or large pleural effusions on the contralateral side if the position of the highest point of the meniscus of fluid along the lateral chest wall on one side was higher than that on the contralateral side by more than one centimeter. The patients' medical records were also reviewed to see if thoracentesis was performed in any of these cases. The diagnosis of pleural effusion confirmed in all patients using plain chest radiograph which also helped in estimation of the amount of the pleural effusion was further confirmed during closed tube thoracostomy drainage as the initial amount of pleural fluid drained into the drainage bottle following placement of the drainage tube. Samples of the fluid were subjected to biochemical analysis bases on the parameters of Light's criteria for characterisation of the pleural effusion as transudate or exudate. It was the only single case of exudate that was subjected to further tests of cytology, microscopy, culture and sensitivity, and Ziehl-Nellsen stain. Analysis was by simple proportions and percentages. Out of the 342 adult patients diagnosed, admitted, and treated for heart failure during the study period, only ten (2.9%) had associated significant pleural effusion in 12 pleural spaces that required pleural drainage. 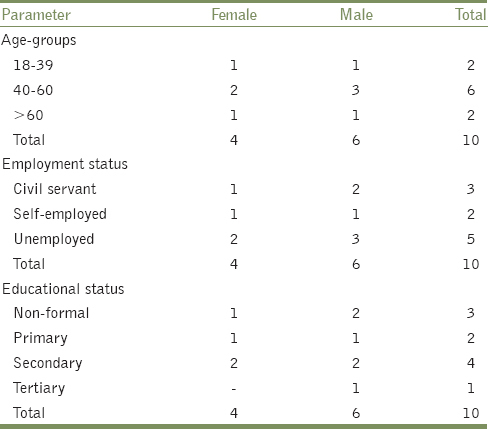 There were six males and four females and all ten patients were adults with the modal age-group being 40-60 years where 60% of the patients belonged [Table 1]. The remaining 40% were evenly distributed in the below 40 years and above 60 years age-groups. Analysis of the occupational status of the ten patients shows that 50% of them were unemployed as at the time of onset of their illness, while the remaining were either public servants (30%) or self-employed (20%). [Table 1] further shows that half of the patients were either uneducated or attended only primary education, while the remaining 50% had secondary education (40%) or tertiary level of education (10%). [Table 2] shows that the cardinal symptoms of cardiac failure were experienced by all the ten patients who had significant pleural effusion. These symptoms include cough, dyspnea, easy fatigability, and dependent edema, while [Table 3] shows the causes of heart failure to include systemic hypertension in 50% of the patients, rheumatic heart disease in 30%, and dilated cardiomyopathy in the remaining 20% of the patients. By Light's criteria, the pleural effusion was transudates in 90% of the cases, while exudates was discovered in only 10% of the cases. Analysis of the distribution of the pleural effusion shows that 50% occurred in the left side, 30% in the right side and the remaining 20% occurred bilaterally [Table 4] and [Table 5] contains information on the severity of the pleural effusion and the response of the patients to the drainage of the pleural effusion. Of the three patients whose pleural fluid accumulation was less than 1000 ml, only one (33%) had symptomatic improvement upon drainage of the pleural effusion, while two (66%) did not have significant symptomatic relief immediately following pleural fluid drainage. Again of the two patients whose pleural effusion was between 1000 to 2000 ml, one (50%) had symptomatic improvement upon drainage of the pleural effusion, while one (50%) did not. Outstandingly, all the five (100%) patients whose pleural effusion was more than 2000 ml had significant symptomatic relief upon drainage of the pleural effusion. However, more recently, it has been discovered that pleural effusion of uncomplicated heart failure can in up to 25% of cases be exudate, and it can be distributed bilaterally worse on any side, right-sided, or left-sided. This present study corroborated this with significant left sided pleural effusion being present in up to 50% of patients with congestive heart failure who needed pleural drainage with 10% being exudates [Table 4]. This study documents 2.9% cases of significant pleural effusion in heart failure necessitating pleural drainage. Of the patients whose pleural effusion was less than 1000 ml, only about 33% reported improvement in symptoms immediately following pleural fluid drainage. The improvement was based on respiratory effort and exercise tolerance. This may imply that in heart failure patients whose pleural effusion is less than 1000 ml, pleural drainage may not be absolutely necessary. However, when the pleural effusion is estimated to be above 2000 ml, pleural drainage becomes absolutely beneficial as 100% of the patients in this category had symptomatic improvement following pleural drainage. For patients whose pleural fluid is between 1000-2000 ml, the possibility of benefit stands at 50% as exhibited by this same study. Pleural effusion of heart failure can occur bilaterally or unilaterally in either pleural space, can be transudate or exudates, and should be drained when significantly massive to contribute to symptoms. Fridlender ZG, Gotsman I. Pleural effusion. N Engl J Med 2002;347:1286-7. Light RW, Broaddus VC. Pleural Effusion. In: Murray JF, Nadel JA, Mason RJ, Boushey HA, editors. Textbook of respiratory medicine. 3 rd ed. Philadelphia: WB Saunders; 2000. p. 2013-41. Johnson JL. Pleural effusions in cardiovascular disease: Pearls for correlating the evidence with the cause. Postgrad Med 2000;107:95-101. Porcel JM. Pleural effusions from congestive heart failure. Semin Respir Crit Care Med 2010;31:689-97. Chakko S. Pleural effusion in congestive heart failure. Chest 1990;98:521-2. Raasch BN. Carsky EW, Lane EJ, O′Callaghan JP, Heitzman ER. Pleural effusion: Explanation of some typical appearances. AJR Am J Roentgenol 1982;139:899-904. Maestre A, Gil V, Gallego J, Aznar J, Mora A, Martín-Hidalgo A. Diagnostic accuracy of clinical criteria for identifying systolic and diastolic heart failure: Cross-sectional study. J Eval Clin Pract 2009;15:55-61. Vix VA. Roentgenographic recognition of pleural effusion. JAMA 1974;229:695-8. Onadeko BO. The radiological patterns of pleural effusions in Nigerians. Niger Med J 1979;9:687-91. Colins JD, Burwell D, Furmanski S, Lorber P, Steckel RJ. Minimal detectable pleural effusions. A roentgen pathology model. Radiology 1972;105:51-3. Woodring JH. Distribution of pleural effusion in congestive heart failure: What is atypical? South Med J 2005;98:518-23. Weiss JM, Spodick DH. Laterality of pleural effusions in chronic congestive heart failure. Am J Cardiol 1984;53:951. Muller NL, Fraser RS, Colman NC, et al. Radiologic Diagnosis of Diseases of the Chest. Philadelphia: WB Saunders Co; 2001. p. 653-4. Kinasewitz GT. Transudative effusions. Eur Respir J 1997;10:714-8. Herlihy JP, Loyalka P, Gnananandh J, Gregoric ID, Dahlberg CG, Kar B, et al. PleurX catheter for the management of refractory pleural effusions in congestive heart failure. Tex Heart Inst J 2009;36:38-43. Chetty KG. Transudative pleural effusions. Clin Chest Med 1985;6:49-54. Ekpe EE. Akpan MU. Poorly treated broncho-pneumonia with progression to empyema thoracis in Nigerian children. TAF Prev Med Bull 2010;9:181-6. Kataoka H. Pericardial and pleural effusions in decompensated chronic heart failure. Am Heart J 2000;139:918-23. Natanzon A, Kronzon I. Pericardial and pleural effusions in congestive heart failure-anatomical, pathophysiologic, and clinical considerations. Am J Med Sci 2009;338:211-6. Peterman TA, Brothers SK. Pleural effusions in congestive heart failure and in pericardial disease. N Engl J Med 1983;309:313. Brixey AG, Light RW. Pleural effusions occurring with right heart failure. Curr Opin Pulm Med 2011;17:226-31. Kalomenidis I, Rodriguez M, Barnette R, Gupta R, Hawthorne M, Parkes KB, et al. Patient with bilateral pleural effusion: Are the findings the same in each fluid. Chest 2003;124:167-76.